It is widely accepted that Twitter is a horrible place, full of Nazis, misogynists, near-provocations of nuclear war with North Korea and people who openly call themselves Thought Leaders. But! Every now and then something good happens on Twitter. 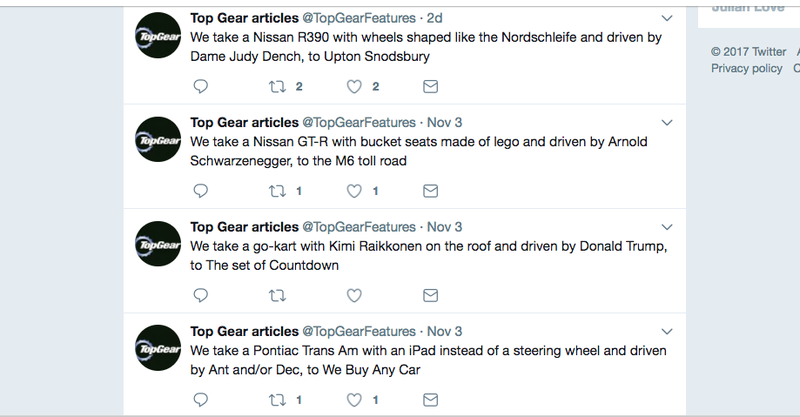 This is one of those times, and the result is a ton of Top Gear episodes I’d love to watch. Who even runs that? I should look into that, maybe.